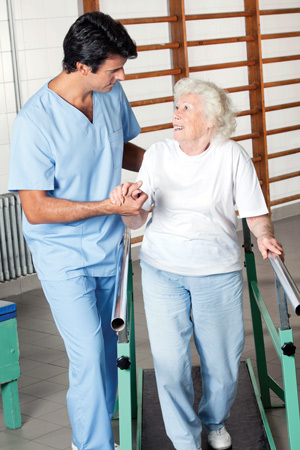 Despite the documented benefits of supervised exercise in patients with claudication, its effect on actual clinical practice has been disappointing due to a lack of reimbursement. But practitioners and research­ers have been investigating other options, with encouraging preliminary results. Clinicians treating intermittent claudication, a common symptom of peripheral arterial disease (PAD), face a vexing conundrum: the safest and most effective treatment, supervised walking, isn’t reimbursed by Medicare or private insurance. The result has been a scramble to find ways to give patients relief without draining their bank accounts. Claudication refers to leg pain while walking; the pain is often felt in the calves, but may also occur in the thighs or buttocks.1 According to Mary McDermott, MD, a professor of medicine and preventive medicine at Northwestern University’s Feinberg School of Medicine in Chicago, by definition the pain begins as a result of exertion and typically subsides within 10 minutes of stopping to rest. The reasons for the condition are complex and systemic. Arterial lesions limit the flow of blood, starving muscles of the oxygen they need during exertion, and this causes pain.1 According to McDermott, common areas of occlusion include the femoral arteries and the aortal iliac. One issue from both a research and clinical perspective, she said, is that claudication occupies a somewhat blurry position on a spectrum of afflictions related to PAD. McDermott has conducted studies on exercise and PAD together with claudication and its close relatives. For example, in a 2009 paper in the Journal of the American Medical Association, she assessed whether supervised treadmill exercise and lower extremity resistance training, respectively, improved functional performance, versus a control group that participated in nutritional information sessions, in patients with and without intermittent claudication (IC).2 Of 156 participants, about 19% had strictly defined claudication. Nevertheless, supervised treadmill exercise improved six-minute walk distance, walking performance, quality of life (QOL), and other measures, in PAD patients both with and without classic symptoms of IC. Resistance training had similar effects. Judy Regensteiner, PhD, another UC Denver professor of medicine and a colleague of Hiatt’s, agreed. Despite the advantages supervised exercise offers, its effect on actual clinical practice has been disappointing due to the lack of reimbursement. Physicians are presented with difficult choices as a result. A recent paper by Mary McDermott supports this notion.6 In a trial of 194 patients with PAD (with and without classic claudication), participants were randomized to either a home-based group-mediated walking intervention or to a control group that received group-based health education. Those in the intervention cohort met once weekly for 90 minutes with other participants in groups led by a trained facilitator. They spent 45 minutes in discussion and 45 minutes walking around an indoor track; the discussions included topics such as the benefits of walking for PAD, goal-setting, self-monitoring (in this case, using pedometers), and managing pain. They were also instructed to do over-ground walking at least five days per week, working up to 50 minutes per session; they walked to severe leg discomfort, then rested until the pain subsided enough to resume. Over the course of the study, those in the walking cohort significantly increased their six-minute walk distance, maximal treadmill walking time, and other scores, whereas controls did not. Another recent study bolsters the case for home-based exercise. In a controlled trial published in Circulation in 2011, researchers at the Oklahoma University Health Sciences Center in Oklahoma City randomized 119 patients to three groups: 29 for home-based exercise, 33 for supervised exercise, and 30 as usual-care controls.7 Home-based exercise was quantified with a step activity monitor and designed to be as similar to the supervised program as possible. Both consisted of 12 weeks of intermittent walking to near-maximal claudication pain three days a week, progressing to 45 minutes per session by the last two weeks of the study. Both the supervised and unsupervised groups significantly increased claudication onset time and peak walking time; surprisingly, only the home-based intervention also increased average cadence. Andrew Gardner, PhD, the study’s lead author and an exercise physiologist at the university, said that though supervised walking remains the gold standard, home-based alternatives show increasing promise. Because diabetes is a risk factor for PAD (55% of PAD patients also have diabetes),8 one study has examined the effect of a home-based walking intervention in patients with both conditions.9 Researchers randomized 145 participants to either a program targeting levels of readiness to engage in routine walking for exercise, or to a control group that received twice-monthly status checks by phone. After six months, neither group differed significantly from baseline levels with regard to maximal treadmill walking distance; however, the home-based intervention did improve walking speed and QOL. The study’s lead author, Tracie Collins, MD, MPH, told LER that the study included both those with classic claudication and those with related symptoms such as pain that began before heavy exertion. Patients were asked to walk three days a week on their own, then to join one of the researchers—an exercise instructor—one day a week to walk with others in the cohort, for social support. They also received phone calls every two weeks to assess their status. Collins shares Mary McDermott’s concern about patients with different symptom subtypes. The right way, in this case, means what Collins refers to as a training effect, which helps patients’ muscles become more conditioned. Researchers and clinicians have developed alternative approaches to exercise for claudication patients who, for various reasons, may not respond well to walking. For example, in a 2009 study, researchers at the University of Minnesota in Minneapolis randomized 41 patients to 12 weeks of supervised exercise training using either treadmill walking, dynamic arm exercise, or a combination of the two.10 They discovered that maximal walking distance increased almost as much in the arm exercise group (53%) as in the treadmill and combination groups (69% and 68%, respectively). The lead author of both studies, Belinda Parmenter, PhD, is an exercise physiologist at the University of Sydney in Australia. She told LER that she first became interested in alternative training methods for claudication patients by working with her father, a vascular surgeon. Parmenter was working on her doctorate at the time; her advisor had had good results with weight and resistance training for patients with a variety of conditions, and suggested she investigate these methods for PAD and claudication patients. Parmenter developed a circuit of what she calls lower extremity aerobic exercises that included squats, jumps, calf raises, knee extensions, and the like. In her review article, Parmenter also reported that, as in the Minnesota study, arm exercise (in this case, cranking) was effective. In all cases, supervision while the routines were being established was critical. One exercise notably absent from the literature is swimming. Parmenter suspects this has to do with the underlying cardiovascular issues associated with claudication and PAD. As noted earlier, many clinicians turn to vascular interventions to treat claudication. These may include approaches such as angioplasty in the leg arteries or stent placement in the pelvic arteries. “People with claudication typically experience leg pain not due to blockage in the leg arteries, but rather in the pelvis,” said Timothy Murphy, MD, a professor of diagnostic imaging at Brown University Medical school and an interventional radiologist at Rhode Island Hospital, both in Providence. Increasingly, however, clinicians are interested not in opposing the approaches but in combining them. A 2012 paper in Circulation reported the results of the CLEVER (Claudication: Exercise versus endoluminal revascularization) study, in which 111 patients with PAD were randomized to receive one of three treatments: optimal medical care (OMC), OMC plus supervised exercise (SE), or OMC plus stent revascularization (ST).20 Researchers found that SE resulted in better treadmill walking performance than ST, even for those with aortoiliac PAD, but that ST was associated with better patient-reported QOL. Timothy Murphy, the study’s lead author, told LER that he considers the matter open. Hiatt noted that these are, nevertheless, essentially symptom treatments, and that patients will continue to have to address the basic issues. 1. Casanegra A, Esponda O, Gardner A. Exercise helps reduce claudication symptoms. LER 2013;5(3):41-46. 2. McDermott MM, Ades P, Guralnik JM, et al. Treadmill exercise and resistance training in patients with peripheral arterial disease with and without intermittent claudication: a randomized controlled trial. JAMA 2009;301(2):165-174. 3. Watson L, Ellis B, Leng GC. Exercise for intermittent claudication. Cochrane Database Syst Rev 2008;8(4):CD000990. 4. Fokkenrood HJ, Bendermacher BL, Lauret GJ, et al. Supervised exercise therapy versus non-supervised exercise therapy for intermittent claudication. Cochrane Database Syst Rev 2013;8:CD005263. 5. Mays RJ, Rogers RK, Hiatt WR, Regensteiner JG. Community walking programs for treatment of peripheral artery disease. J Vasc Surg 2013;58(6):1678-1687. 6. McDermott MM, Liu K, Guralnik JM, et al. Home-based walking exercise intervention in peripheral artery disease: a randomized clinical trial. JAMA 2013;310(1):57-65. 7. Gardner AW, Parker DE, Montgomery PS, et al. Efficacy of quantified home-based exercise and supervised exercise in patients with intermittent claudication: a randomized controlled trial. Circulation 2011;123(5):491-498. 8. Collins TC, Petersen NJ, Suarez-Almazor M, Ashton CM. The prevalence of peripheral arterial disease in a racially diverse population. Arch Intern Med 2003;163(12):1469-1474. 9. Collins TC, Lunos S, Carlson T, et al. Effects of a home-based walking intervention on mobility and quality of life in people with diabetes and peripheral arterial disease. Diabetes Care 2011;34(10):2174-2179. 10. Treat-Jacobson D, Bronas UG, Leon A. Efficacy of arm-ergometry versus treadmill exercise training to improve walking distance in patients with claudication. Vasc Med 2009;14(3):203-213. 11. Parmenter BJ, Raymond J, Dinnen P, Singh MA. A systematic review of randomized controlled trials: walking versus alternative exercise prescription as treatment for intermittent claudication. Atherosclerosis 2011;218(1):1-12. 12. Parmenter BJ, Raymond J, Dinnen P, et al. High-intensity progressive resistance training improves flat-ground walking in older adults with symptomatic peripheral arterial disease. J Am Geriatr Soc 2013;61(11):1964-1970. 13. Murphy TP, Ariaratnam NS, Carney WI, et al. Aortoiliac insufficiency: long-term experience with stent placement for treatment. Radiology 2004;231(1):243-249. 14. Fakhry F, Rouwet EV, den Hoed PT, et al. Long-term clinical effectiveness of supervised exercise therapy versus endovascular revascularization for intermittent claudication from a randomized clinical trial. Br J Surg 2013;100(9):1164-1171. 15. Perkins JM, Collin J, Creasy TS, et al. Exercise training versus angioplasty for stabile claudication. Long and medium-term results of a prospective, randomized trial. Eur J Vasc Endovasc Surg 1996;11(4):409-413. 16. Spronk S, Bosch JL, den Hoed PT, et al. Intermittent claudication: clinical effectiveness of endovascular revascularization versus supervised hospital-based exercise training: randomized controlled trial. Radiology 2009;250(2):586-595. 17. Bo E, Hisdal J, Cvancarova M, et al. Twelve-months follow-up of supervised exercise after percutaneous transluminal angioplasty for intermittent claudication: a randomized clinical trial. Int J Environ Res Public Health 2013;10(11):5998-6014. 18. Mazari FA, Gulati S, Rahman MN, et al. Early outcomes from a randomized, controlled trial of supervised exercise, angioplasty, and combined therapy in intermittent claudication. Ann Vasc Surg 2010;24(1):69-79. 19. Mazari FA, Khan JA, Carradice D, et al. Randomized clinical trial of percutaneous transluminal angioplasty, supervised exercise and combined treatment for intermittent claudication due to femoropopliteal arterial disease. Br J Surg 2012;99(1):39-48. 20. Murphy TP, Cutlip DE, Regensteiner JG, et al. Supervised exercise versus primary stenting for claudication resulting from aortoiliac peripheral artery disease: six-month outcomes from the Claudication: Exercise Versus Endoluminal Revascularization (CLEVER) study. Circulation 2012;125(1):1340-1349.